Liverpool Telescope frame of the AGN 0957+561 on 5th December 2011. This typical 120 second exposure in SDSS-R band shows the two images of the gravitationally lensed AGN, which are separated by ~6 arcsec (marked with a blue arrow). A long-term photometric monitoring study with the Liverpool Telescope (LT) was recently used to unveil the nature of the accretion flow and jet connection of a distant active galactic nucleus (AGN) for the first time. This project was conducted by the GLENDAMA research team (Rodrigo Gil-Merino, Luis J. Goicoechea, Vyacheslav Shalyapin and Vittorio F. Braga) at the Universidad de Cantabria (Spain), and the LT has been the key facility to carry it out. AGNs generate spectacular X-ray, ultraviolet (UV) and optical continuum luminosities by matter accretion onto their central rotating supermassive black holes. However, the precise geometry and origin of this huge energy production is still largely unknown, and direct spatial resolution of the emitting regions from such objects is not currently possible. Fortunately, there is a time-domain technique to probe the accretion physics for AGNs. This is the so-called "continuum reverberation" (or echo) mapping, which relies on the analysis of time-delayed responses of different continuum emitting regions to original fluctuations in a driving source. A successful reverberation analysis requires multiwavelength monitoring during a period of strong variability. At redshifts z > 1, this task is much easier to plan for a gravitationally lensed AGN (the gravitational field of foreground galaxies produces two or more images of the same background galaxy nucleus), since the variability of some of its multiple images can be predicted in advance based on an optical follow-up of the lens system on a nightly basis. 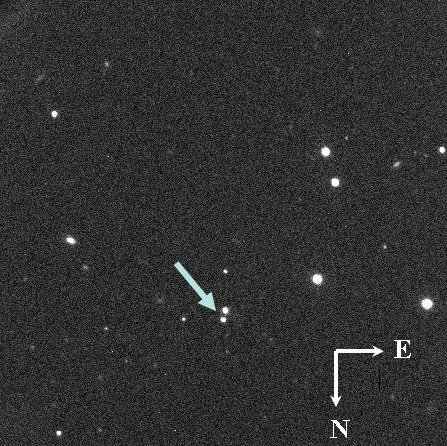 The double-image AGN 0957+561 (designation based on its position in the sky) is located at a luminosity distance from Earth of ∼33 thousand million light years (z = 1.41), and it was intensively monitored with the LT between 2005 and 2010. As intrinsic flux variations in the image 0957+561B lag those in the image 0957+561A by about 14 months, the LT detection of significant flux variations in 0957+561A between late 2008 and mid-2009 allowed the GLENDAMA team to organize a multiwavelength follow-up campaign during the first semester of 2010. This included observations with two NASA satellites: Chandra X-ray Observatory and Swift, supported by the LT in the Sloan "griz" passbands. The X-ray, UV and optical brightness records of 0957+561B in 2010 confirmed its intrinsic origin and led to a reverberation mapping of the continuum sources in the distant AGN. For example, the UV-optical fluxes in the Ugr passbands were used to detect interband delays of several days, U leading and r trailing. These delays are consistent with the existence of a driving source very close to the central supermassive black hole, which illuminates a standard accretion disk and induces variations in disk rings at only a few light-days from the massive dark object, i.e., at sub-milliarcsecond angles as seen from Earth! While the central driving source cannot be a standard corona that is emitting the observed X-rays with a power-law spectrum, a central extreme UV source is the best candidate to drive the variability of 0957+561. It would be sited just above the black hole and below the base of the jet perpendicular to the disk. The GLENDAMA team plausibly interpret their data as evidence for a power-law X-ray source in the base of the jet at a typical height of ∼60 light-days. Although the rapid rotation of the 2.5 thousand million solar mass black hole presumably disrupts the corona and converts it into a jet, the jet itself would keep a hot base as a "residual corona". This is a benchmark study to understand the accretion flow in primeval AGNs displaying jets. The data are available on-line, and the results are presented in the January 1, 2012 issue of The Astrophysical Journal (journal subscription necessary).